Four years young today, I can't begin to say how much I love you. Thank you for being such a light in our lives, Happy Birthday Fuzz Bucket! Normal anti-sappy service will resume shortly! Please don't laugh at me...and we have been featured! The weather is meant to break soon, so we will have lots of time stuck inside, hehe. Firstly a BIG thank you to Oskar & Pam over at Pet Blogs United for featuring us here! Please go visit the site, the duo do wonderful things and make sure you check out the other featured bloggers too, there are some really cool peeps! Now she normally does quite a good job, beside some odd bald bits, so considering she ins't a groomer we will let her off. But this year (and partly because the clippers broke) she decided to take him to the groomers. Needless to say Mum was NOT impressed, they shaved the poor lad! See all his bald patches? She will not be taking him there again. It gave us all a jolly good laugh though. Never mind big lad, it will grow back, eventually! We promise to get round all your blogs in the next few days once Mum has freed some time up, in the mean time have a great week everyone and please laugh at Dante some more! Well in case you haven't noticed Mum, our typist and photographer seems to have been taking her blogging duties not as seriously as we would have liked lately! We do insist that she taking her responsibilities seriously, but we have taken matters into our own hands...er paws. So considering we posses neither hands with opposable thumbs or computer skills, I think we are doing well so far! Along with our usual escapades Mum decided to take us all, including Dante to one of our very favourite walkies, at a place called High Dam. Me and Daisy Boo went a few months ago, you can read about it here! It's a lovely place to walk, the Lake District tends to get really busy now its getting warmer and Mum can take us here and hardly meet anyone! There were lots of good sniffs...if you can't tell. :) There are lots of different routes for us to take, but considering Dante still has his off days with his leg Mum decided to take the most gentle route. I decided to run everywhere but the path, the bluebells were coming through, so they deserved a good run through. We love the forest because there are so many different things to eat roll in and smell! I don't really know what I was sniffing in this big pile of moss but it was goooood. Miss Daisy Boo had a permanent smile slapped on her face the whole walk! 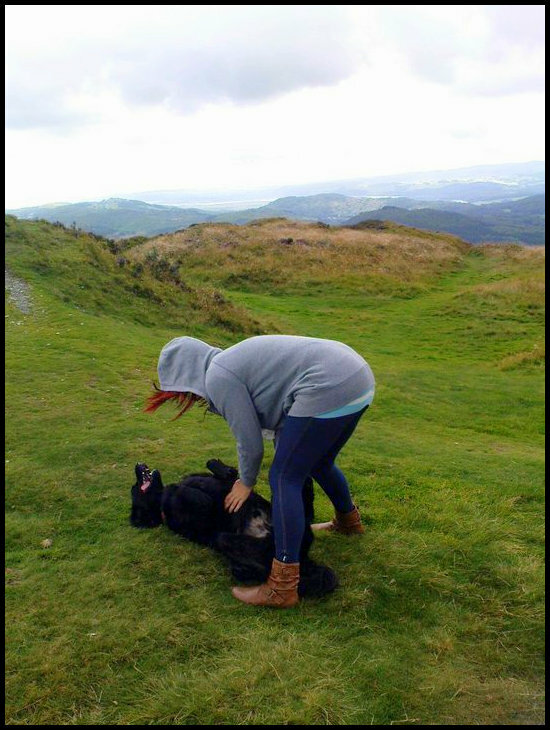 Dante was less impressed with Mums photo taking, STOP IT AND LET US WALK WOMAN! I know I am highly intelligent but gates is something I can't do....could you open this for us Mum? Oh har har, let us through now! Dante was getting a big tired so we cooled off in the stream for a bit, look at that happy mug! The water made us all a bit giggy and we round round like loonies, Mum shouted at us to calm down, party pooper! There are lots of different walks round the Dam but today, to help Dante we took the easiest route, with lots of bridges! Did you know Dante was terrified of these when he was younger? But look at him now! The path we took often lead right up to the edge of the Tarn, so obviously we did lots and lots and lots of swimming, although I tend to bounce unless I have to swim! But when I do swim, I still beat my brother and sister, it must be my long legs.. The water is so cold though! If you can't tell by my face, bol! The path then veers from the lake into a sort of marshland, where Daisy Boo got very very VERY dirty, oh Miss Boos you have just been swimming too! We started to head back after our silly zoomies because it was getting late and it was going to be dark soon! Personally I wanted to stay but Mum said no, unfair! But before we left we had our obligatory last swim! Now there are a few little islands dotting the lake, so when Mum threw the ball for us to go get, Daisy Boo picked it up and swam to the island, we all followed, then we were all very confused about why Mum was across the water, BOL! On the way back to the car there were a few more of these bridges, and we were all flagging a bit because of all that swimming! Dante however stood and said his sad goodbyes to the Lake, don't worry big lad, we will be back soon! Daisy boo did a very thorough job at finding the car again for us, Thanks Boos! Daisy Boo riding shotgun with Mum, she just about fits in the bucket seats...fatty bum! Don't tell her I said that or she will kill me, hehe! Me taking up the whole of the back seats with my harness on, I can't believe we all used to fit in the boot! And finally, a very sad looking Dants in the boot. Now Don't feel bad for him stuck in the back, he and Daisy Boo normally sit in the back together, but because his legs gets a bit stiff after long walks Mum put Boos in the front so Dante had lots more room to stretch! We hoped you enjoyed coming on our hike with us, the weather here has been unseasonably cold, its nearly summer but it feels like March. Also now we are in charge of the computer we plan on making for frequent visits round blogville, you hear that Mum?! Everyone have a fantastic week and a great weekend.